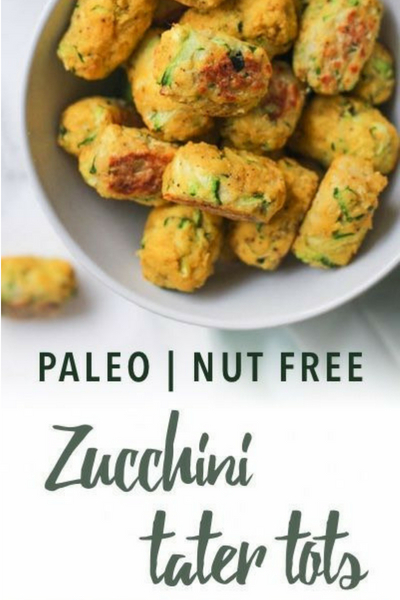 From Lauren: This week’s recipe for Paleo Zucchini Tots is another contribution from the creative Jean Choi. The first time I had tater tots was when I was in middle school. 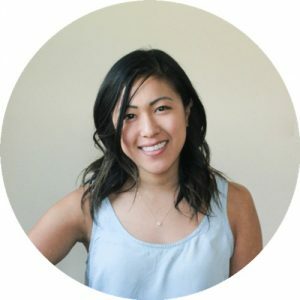 I grew up in a Korean-American household eating mostly Korean dishes, so there were certain foods that I didn’t know about until I got older and started spending more time with my friends. I still remember the first time tasting tater tots at a local diner in our town. It was so deliciously crispy and creamy on the inside, and I was almost mad that I didn’t know about this magical food before that moment. Since then and through college, they stayed as one of my favorite menu items when dining out. 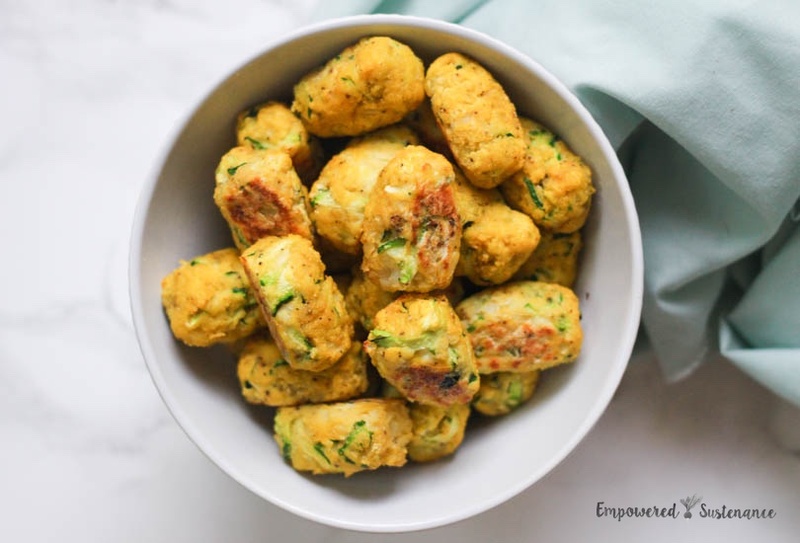 These days, I try to eat fairly low sugar and low carb because that’s what makes me feel my best, so I made these Cauliflower Zucchini Tots as a way for me to fulfill my tot-cravings that occasionally come up. They definitely do the trick for me so I hope you enjoy them as well! Cauliflower – I’ve been loving cauliflower recently as a way to create a smooth texture without sacrificing flavor. It does exactly that in this recipe, making the tots deliciously creamy inside. Zucchini – Similar to cauliflower, zucchini has a mild flavor and also creates a creamy texture. I also like that I’m adding extra nutrients in this recipes without anyone knowing that it’s packed with delicious veggies! Zucchini holds a lot of moisture, so make sure to squeeze out as much excess water as you can. Coconut flour – Coconut flour is one of my favorite paleo flours to use, but it can act very differently from other grain free flours. I wouldn’t recommend you use any other substitutions for this recipe. Eggs – Eggs act as a binder so you can shape the tots. If you want to make this recipe egg-free, you might be able to get away with gelatin eggs since I’ve seen similar recipes that use them. No guarantees though! Nothing goes with tater tots like ketchup. You’ll love Lauren’s recipe for Easy Peasy Paleo Ketchup. Watch the video below and get the full recipe here. 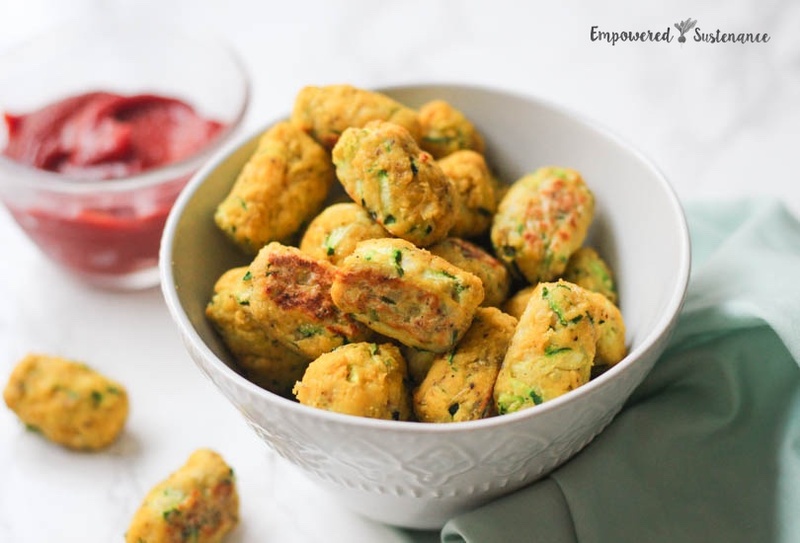 These tater-free tots are paleo-friendly thanks to a combination of cauliflower and zucchini. Preheat oven to 400 degrees F. Grease a baking sheet, or line it with parchment paper. Heat coconut oil in a skillet over medium heat. Add caulifower rice to the skillet and sauté until tender, about 5 minutes. Place grated zucchini in a cheesecloth or paper towel and squeeze out all the excess water. In a large bowl, combine, cauliflower rice, zucchini, coconut flour, eggs, extra virgin olive oil, garlic powder, onion, sea salt, and pepper. Combine well. Use a tablespoon to scoop out the mixture and shape into a small oval logs. Transfer to a greased baking sheet and bake for 25 minutes, turning about halfway through. If you want crispier tots, you can broil them for 1-2 minutes. Serve with ketchup or your favorite sauce. These look so yummy! I don’t have a ricer though, would pulsing the cauliflower in a blender give it a similar effect? Thank you Lauren! Hi Sarah C. I pulse my cauliflower in the blender to make rice all the time. I don’t buy pre-packed. Thanks so much, Rowena! I was going to just attempt it but I’m glad to know that it actually works for you:) Take care! You can also buy them already riced at Trader Joe’s or Costco. So convenient! Thank you! Yes, they are definitely kiddo-friendly. They’ll have no idea that they are eating all the veggies! Yes, my toddler loves these – without sauce. Would these work to make ahead and then freeze, I’m a mom of three and that would make it so much more convenient for us. I’ve never tried freezing them but I think it could work. Just form them into small logs and freeze. Defrost and bake them the same way! These sound soooo good. It’s a little more trouble than I usually go to with veggies…I typically just cut up, roast, and eat! But since riced cauliflower is so easy to find these days I might need to try these. Thanks for the creative idea! Have you ever used an Airfryer to cook your Tots? I made these this weekend. I won’t go to the trouble again. I’d rather just have roasted cauliflower and sauteed zucchini. The flavor of these just wasn’t there for me. I followed the recipe exactly and then had to cook longer as they were brown but not at all crisp. They never did get crisp. Just a soft pillow of cauliflower tasting yuck. I am Thankful to the owner of this site who has shared this impressive recipe. This is my first comment on any site and i just want to Thank you for such a nice recipe.